Plot: Parshya (Akash Thosar) and Archie (Rinku Rajguru), two eighteen-year-olds in Bittergaon, fall in love. My brain balks at writing about Sairat. I’ve already watched a movie (the incredibly fun Mr. Right) and had a work discussion trying to save a failing idea, in attempts to find something else to do. Where does one even begin? I’m in danger of just writing “AAAAAAAA” and leaving it at that. That’s what my brain does when too many things rush into it at the same time, especially if the things rushing in are emotionally upsetting. The birds. Maybe you’d like to hear about the birds. 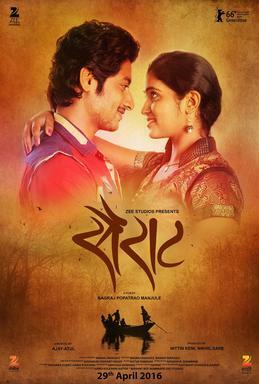 Sairat is set in Bittergaon, Mahrashtra, and in Karmala, Maharashtra, and in Hyderabad. All these places house birds. Flocks and flocks of them. Sometimes they are in the air and they fly in complex formations, shapes seamlessly bending inwards and inverting to become other shapes, as when Parshya (Akash Thosar) and Archie (Rinku Rajguru) first openly admit their love for each other. Sometimes, they fly as individuals, hither and thither, as when Parshya is running to the well to catch a glimpse of his lady love. And at other times, the flock of kabutars gets disrupted and takes off in a ruffled pandemonium. I don’t know what to say. A fisherman’s son, a Kale, and a landlord’s daughter, a Patil, fall in love. They’re found. Much beating follows. They run away to Hyderabad, and make a life there. They get married, have a kid.And when they drive past young couples being harassed by Hindutva goons, there’s a moment of discomfiture and no change in speed. And when their relationship is on the rocks, his insecurities take over and he hits her. It’s good, I suppose, that Mr. Manjule didn’t feel the need to make them perfect, and Sairat is an infinitely better film for it. Doesn’t make it any easier to watch. Or maybe I can talk about the world. It is richly textured, full of life, replete with history… is that enough cliches? It’s true, though. Often, the most enduring legacy of a work is the world it creates, and this world is certainly a contender for a world that will stay in the minds of moviegoers. Or the gimmick. The music from this movie, I’m told, is very popular. Because it’s all love songs. And the promotion, similarly, seems to be as a teenage love story. And the beginning, Parshya is the alpha eighteen-year-old of Bittergaon – clean, non-tobacco-chewing, athletically gifted, academically high scoring, a poet – and Archie the alphaess – the spunky, gender-stereotype-busting rich girl. I’m sure there’s a ’90s Salman Khan and Juhi Chawla movie that fits a similar description. But, of course, it’s not a love story. Well, not just. This, of course, is not an accident; Mr. Manjule wants the urban masses to watch this film, so he lulls them in with promises of Marathi Salman Khan. A move whose wisdom has been vindicated again by the reactions to various events at various campuses in the last year: it’s the same concerns in garb that’s not immediately identified as anti-national and thereby dismissed. Or… aagh, it’s getting infuriating trying to say things without revealing too much of the dramatic arc of the movie; it’s just too hard. Here’s your takeaway, then: Sairat is a damned good movie, made by a man in complete control of his game, and it’s worth the three hours, and it’s worth showing to your conservative aunts and uncles. I am deeply alienated from the society in which I live. I regard our policies as criminal, and politicians of both major sides as evil people. My assessment of our society’s opinion leaders is similar, though milder and less categorical. Many thoughtful people I know regard my rejection of our society as childish. Rather than defend myself, I have two questions for all such people. 1. In what actually existing societies would my alienation be morally justified? Nazi Germany, I hope. North Korea, I trust. How about Saudi Arabia? Putin’s Russia? Napoleonic France? The antebellum South? 2. Look at your answers to Question #1. Now ask yourself: If I grew up in a society in which, by my own account, alienation would be morally justified, would I in fact be appropriately alienated? In how many such cases would I at least inwardly damn my damnable society? And in how many cases would I take the path of least resistance, accepting the status quo as morally tolerable or even laudable? how did u watch this movie its gonna release on 29th today is 28 where did u get chance to watch this movie ? He saw it in a press screening on 27th April. Having seen the film it is indeed difficult to articulate about what you felt about the film without spoiling it. Great observation on the birds! I too have liked the scenes with the birds in the promos very much. good work all sairat team, nice story nagaraj sir , ajay atul sir both r u great , I just remember my old days & those person , she is not in my life currently but its ok ,I m happy because she was happy . onece again good work all sairt terms. Pakistani Soldier to Indian Soldier- “Aur Bhai aur batao, kya chal raha hai aap ke yaha”. Indian Soldier to Pakistani Soldier- “Hamare yaha to SAIRAT chal raha hai”. pakistani soldier komat ani Indian zing zing zingattttt..
Nice review. But the end makes me feel that lovers in an intwr caste film should never trust their relatives. Awesome movie, nice movie, impactful movie, and there is no word to describe this movie. I rely like this movie as well as i rely thanx to all hole Entire team of sairaat. And also i remember my old callage day’s and love days. and how will be to expressed love in simple style it will show in movie. And i like star cast akash ( parsha ) and much more RINKU ( archie). and each and every songs are fabulous. And mindblowing . I rely hates of ajay da and atul da best creation in thinking. Rinku ( archi ) i am nothings to create any word about u.
I have sowe full move u r acting is that such great love see the each and every movement. And parsha is behaveoir like tha me. Movie is really awesome..but i am feeling bad about story end :(. Akash and Rinku really played amazing role in this movie. Congrats to all caste..!! No word to express my feelings , much excited-awaited film after sholay in my life, Great Work done by Nagraj Sir and his team especially Rinku , for you and your work hats of dear , akash you too good very nice. This is really slap on Bollywood films,Experience Actor/Actress.Great work done guys. A great story ..that starts with a dream and ends realistically. Even watching it countless times..it stays in the heart with a hurt that the Love didn’t last. The movie had few scenes which the audience can relate to and few which can be made as memories. A great feeling developed when i watched it for the first time. The songs were, rather, are soulful, each word in the song relates to the person who is in love or i would say, will now look for love, definitely. Parshya and his charms have a spell on me and Archie, no words, beautiful, full of courage and command. Would love to see them again on the silver screen with a similar kind of story with a much better conclusion, so that what happens in Sairat, gets erased & Parshya and Archie’s Love stay within us, forever and for always!!! ‘Sairat’……….awesome music no dought hats off to Ajay Atul. Good comedy, romance , envy ,direction and even cast, over all good masala movie. Great work from Nagraj Manjule , good to see that even Marathi movies are coming with good stories and talented directors like Nagraj manjule. Everything is good about the movie accept the end part , I was really numb after looking last 5 mins part. Last 5 mins violence kills all the fun and it takes the movie to another point. Such violence may impact our youth mentally . Mr Manjule might have shown end in some other manner instead of showing it directly…. I humbly request other directors henceforth to take care of it or else it would definitely give wrong message to youth which may infact their life. Honestly speaking I am not happy with the movie and suggest audience not to give high importance to such stories.